At first I have ignored this error since it wasn’t affecting my DHCP Server behavior, everything was working fine, and clients were obtaining proper IP addresses and network settings. So I have decided to go back and check the DHCP configuration once again, and have a look on the Event ID:1070 already mentioned above. After a bit of research on the error I found it is a good time to understand the relation between the DHCP and NPS server http://technet.microsoft.com/en-us/library/cc726898(WS.10).aspx . Since this is a new behavior with windows server 2008. To make a story short I have concluded that my DHCP server is looking for the NPS server For NAP integration however I didn’t setup any NPS server on the machine and I am not intending to use it, so I thought I would give it a try and try to disable NAP on my DHCP server for all the scopes. So I went to the IPv4 properties and opened the “Network Access protection” Tab examined everything and I disabled the NAP for all the scopes. After disabling NAP I have restarted the DHCP services, and all the error Events that were occurring has disappeared, and then I went back and run the Fwctools on my clients and got successful results, same as the TMG firewall client Auto Detect worked properly. 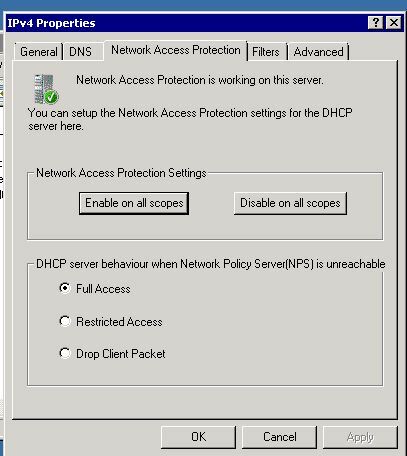 you may notice the above snapshot that the DHCP server behavior when Network Policy Server (NPS) is unreachable is set to full however this didn’t keep the DHCP server from dropping WPAD queries. So I think it might be either a bug in DHCP 2008 R2 or this settings works only when you already have NPS Services installed but not reachable, which find doesn’t makes sence.